Huawei and LG had the honor of unveiling last year's Nexus devices, and it has been reported that the baton of honor will be passed to HTC this year. According to reports, HTC will be given the chance this year to unveil two Nexus devices. In the last few days, we have gotten to know much about these devices, and more details about the specifications have been uncovered. But until now, no live image about these specifications has been seen. This year's Nexus device is named "HTC Nexus Marlin", which will be followed by the smaller version called "HTC Nexus Sailfish". 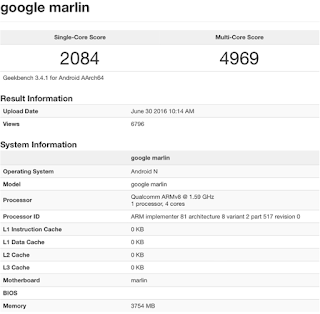 According to the information provided by Geekbench, this device will come with a 1.6GHz quad-core processor. Based on rumors, this device has a fingerprint sensor placed at its back, it is packed with a 3450mAh battery, and it carries a 4GB RAM. It is also rumored to come with a 5.5-inch QHD display with an AMOLED panel. The device has a 12MP rear camera and 8MP secondary camera for selfies. It will come with storage options ranging between 32GB and 64GB. The HTC Nexus Marlin will also be shipped with the new Android N.
Just like it was said earlier, HTC Nexus Sailfish is the smaller version of the HTC Nexus Marlin. 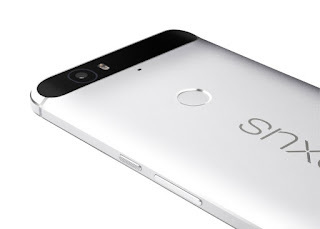 It will follow the Nexus Marlin and will come with a 5-inch FHD display. It will run on a 2.0GHz quad-core processor and be powered by a 2770mAh battery. It is also rumored to carry same cameras as the the Nexus Marlin. This is all we know about these devices for now. We will be sure to notify you, when we any other information about them. I needed to send you one bit of word to thank you so much yet again for these amazing thoughts you have shared on this page. It has been simply open-handed with you to provide without restraint all most people could have made available for an e book to end up making some profit for their own end, principally since you could have tried it if you considered necessary. These guidelines additionally served to provide a good way to recognize that the rest have the same dream like my personal own to understand great deal more around this issue. I am certain there are thousands of more pleasurable instances in the future for people who start reading your blog. I felt amazing reading this info and I believe you are completely correct. Tell me if you are looking into mesothelioma law center, that is my major expertise. I am hoping to check back with you soon enough, take care! Hey there, I am really excited I discovered your web page, I basically discovered you by mistake, while I was searching on Digg for where to watch movies online. Anyways I am here right now and would really like to say cheers for a wonderful blog post and the all around impressive blog (I also like the theme), I do not have time to go through it entirely at the minute however I have bookmarked it and moreover added in your RSS feed, so when I have enough time I will be back to browse much more. Make sure you do keep up the superb job. I do agree with all the concepts you've presented for your post. They are really convincing and can certainly work. Still, the posts are very short for novices. May you please prolong them a little from subsequent time? Thank you for the post. You are absolutely correct, I'd really enjoy to know more on the issue! I'm also interested by dental implants as I think it really is very trendy nowadays. Keep it up! Hello there, what do you really feel about free new movies online? Extremely great matter, right? Great goods from you, man. I've take into accout your stuff previous to and you're just extremely wonderful. I really like what you've received here, really like what you're saying and the best way during which you assert it. You are making it entertaining and you still take care of to stay it wise. I cant wait to read much more from you. This is really a terrific website. Appreciating the dedication you invested in this website and comprehensive facts you provide. It really is great to come across a site every now and then that isn't the same outdated rehashed material. Wonderful read! I have saved your webpage and I am adding your RSS feeds to my free movie streaming page.